The popularity of Bo, the White House's new puppy, is complete: The company that produces Beanie Babies has recently released a shaggy black and white version of the dog — and it is selling fast. The company has previously run into trouble taking inspiration from the Obama family - releasing two dolls resembling the Obama children as part of its Ty Girlz collection but retired the names "Marvelous Malia" and "Sweet Sasha" - when Michelle Obama said using her daughters' names was inappropriate. The dolls were renamed "Marvelous Mariah" and "Sweet Sydney." Less than a dozen "Bo" Beanie Babies were sent to the educational toy shop Learning Express and they sold out quickly, owner Aalap Shah said Wednesday. "We were fortunate enough to receive a small shipment of 'Bo,' " Shah said. "He sold out within a few hours. He was very popular. We can't wait to get some more in." 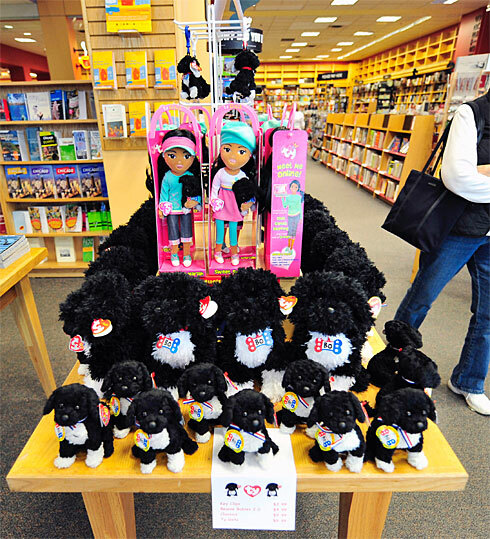 Ty Inc. introduced the stuffed animal on April 16, two days after Bo the Portuguese Water Dog made his White House debut in a photo session with President Obama, first lady Michelle Obama and their daughters, 10-year-old Malia and 7-year-old Sasha. "We are very proud of the First Family and wanted to join in celebrating their choice of a family pet," chief executive officer Ty Warner said in a statement. The "Bo" doll's suggested price is $4.99. It auctioned Wednesday on eBay for between $5 and $139.95. Ty said the company will donate a portion of its profits from the "Bo" doll to local animal shelters.